Why is Big Brother getting all the Attention? Having established that Willow the Vampire is going to learn how to magically transform into a bat, an owl, a mole and a raccoon, possibly a beaver and a water vole, I’ve been looking around for something a little more exotic that would provide me with a good sub plot bubbling under the main thread of my story. Only very skilled vampires – usually quite old ones – know how to transform into larger animals without a hitch. Wolves may be beyond Willow’s capabilities, but smaller creatures are fair game, if you pardon the pun! Unfortunately, Willow didn’t pay a great deal of attention when she was taught at vampire infant school, what vampires need to do to shed their bodies and become another being without losing themselves in the animal’s own personality and its distinct characteristics. As you might expect there will be some fun moments in her journey of discovery, where things don’t go according to plan. While moles and raccoons are rather cute, they are, however, fairly mundane as animals in the rural Stinkforthshire landscape go. Today’s candidate for Willow to try out her magical vampire transformation techniques is something rather special: the Red Panda. I’ve yet to come up with a good reason for her to meet a Red Panda in Stinkforthshire-upon-Avon, a village with just 5,000 inhabitants, but something will spring to mind, no doubt. 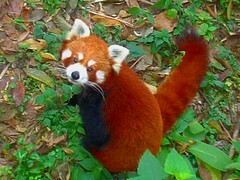 The Red Panda is not so famous as its black and white, much larger “brother” who’s always in the limelight. Every zoo in the world with the necessary £1,000,000 of cash required to maintain a Giant Panda in the style it’s become accustomed to, is trying to persuade China’s government to part with one of these cuddly celebrities – but who is paying good money to see the gorgeous Red Panda, the only bear with a long tail? Unfortunately, my stupid camera ran out of batteries just when I was trying to take pictures of the cutest little Red Panda at Leipzig Zoo, so I’ve had to substitute pictures from two of my encyclopaedias (picture credits: DK Children’s Encyclopaedia of Animals and The Encyclopaedia of Animals – A Complete Visual Guide, Weldon Owen). Doesn’t he remind us of our little friend, the raccoon? 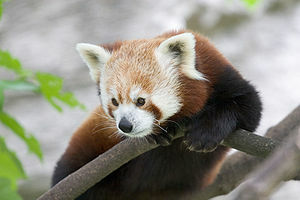 The Red Panda has similar black and white markings in his face and sports a coat of long, coarse hairs that are augmented by an extra dense undercoat to keep the little guy from freezing in the icy cold weather of its mountainous habitat, where he lives at high altitude in territories stretching from Nepal to Myanmar and West China. 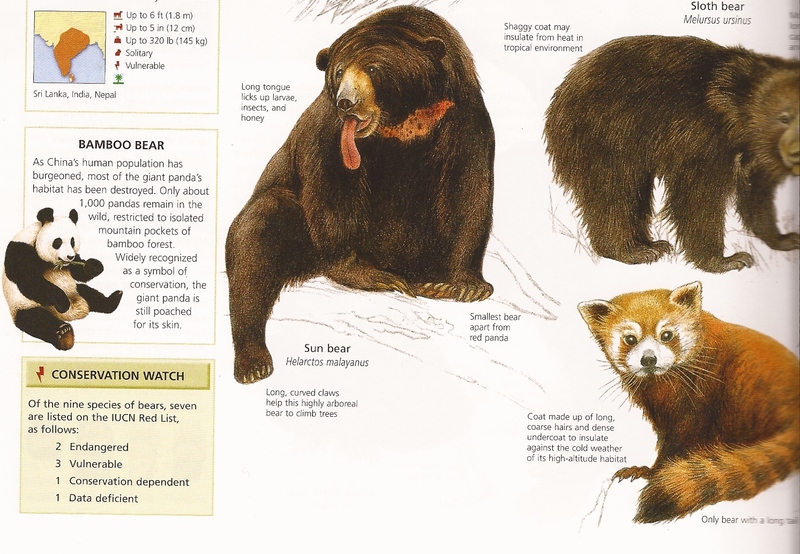 Their superficial resemblance to raccoons once placed them into that family grouping, but the Red Panda, or Ailurus fulgens as its officially known, belongs to the bear family (Ursidae) as one of its smallest members and it’s genetically closest to the Giant Panda. 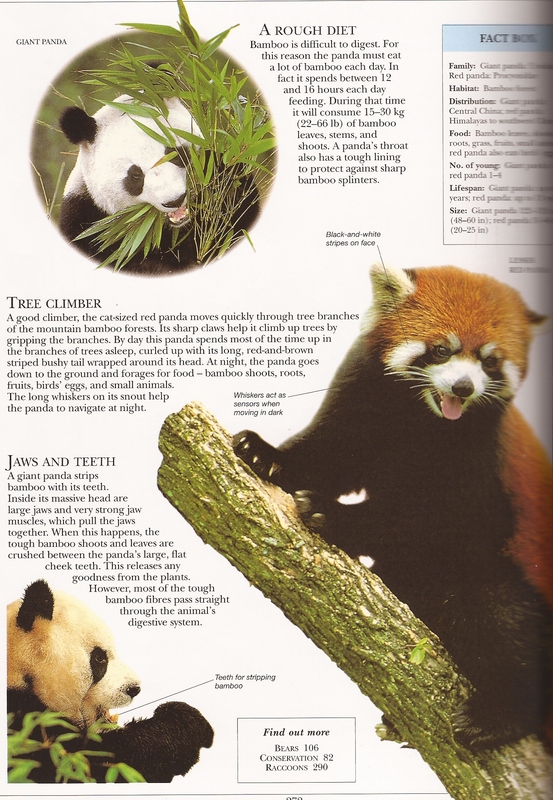 The Red Panda is nocturnal and sleeps during the day high in the trees, before coming down at night to munch on bamboo shoots, birds’ eggs, roots and fruit he finds on the ground. Sometimes the Red Panda even hunts for very small mammals. He has long and very sensitive whiskers, so he can move easily in the dark and find his food more quickly in the dense bamboo forests. He’s a very good climber and has long, sharp claws with which to hold on to branches and snuggle down for a long day’s snooze. From paw to shoulder Red Pandas stand 65 cm tall and can grow up to 48 cm in length with a weight of around 6 kg (12 pounds) each, not much heavier than my fat cat used to be! Just like his much bigger “brother” the Giant Panda, the Red Panda is sadly also on the endangered list, mostly due to loss of habitat. 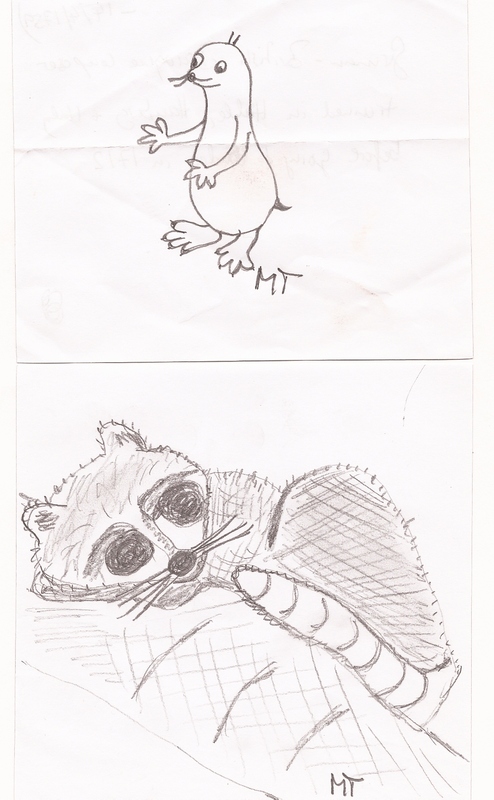 If you had your own private zoo of nocturnal animals, which one would you make the star of the show? You found an animal I’ve never seen before! Of course I’ve heard the words ‘red panda’, but I never would have pictured a little cat- sized cutie with a long tail! Have you considered an Aye-aye, a bit scary, they have a reputation of being a bad omen. 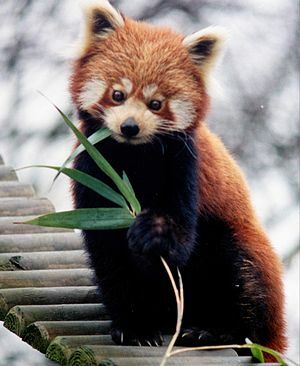 You have sold the red panda to me – what a beautiful creature. Keep writing these interesting posts – they are very cheering. Lucky you, although saying that the urge to hold the little honeybunch would be overpowering. I know, the one I saw “in the flesh” was high up a tree or I’d have jumped into the enclosure to give it a cuddle! Headline in Leipziger Tagesblatt: MAD Anglophile arrested for trying to mate with a Red Panda! That would have had the world’s press after you! I wish I could go and see one. I must look up if London or Bristol Zoo’s got one – or perhaps not, that’s way too close for comfort…I’ve got a backpack that’s just large enough for kidnapping one of these little cuties. Oh my goodness – I can see you splashed across all the newspapers holding a copy of Willow in one hand and the panda in another. All publicity is good publicity, dear! You make me laugh so much! Thank you very much. Laughing is so much healthier than going jogging…I tell myself that after every chocolate bar I eat with a P G Wodehouse novel. I’ve only ever read P.G. Wodehouse, I didn’t know they tasted good to eat. Thanks for the tip – I”ll give Blandings Castle a try. If I remember correctly Blandings Castle comes with pork scratchings taped to the inside cover.